Marfan syndrome (MFS) is a disease in which connective tissue becomes weak secondary to fibrillin-1 mutations, resulting in aortic dilatation, aneurysm formation, aortic dissection, aortic regurgitation and mitral valve prolapse. This autosomal dominantly inherited condition, which was first reported in 1895 and was more fully described in 1931, is characterised by abnormal Fibrillin-1 protein (FBN1) (discovered in 1990), which is encoded by the FBN1 gene (reported in 1991). In the 1970s, the life expectancy of people with MFS was 40–50 years, mainly due to increased risk of aortic dissection or heart failure from aortic or mitral regurgitation. However, due to advances in medical and surgical therapy, life expectancy has improved dramatically and is now comparable to that of the general population. We discuss the cardiac manifestations of MFS, the incidence of arrhythmia in this population, the standard of medical care for arrhythmia and valve insufficiency, and a new use of preventive medication to preserve the integrity of the aortic wall in patients with MFS. This work was supported by Marfan Trust and St George’s, University of London. 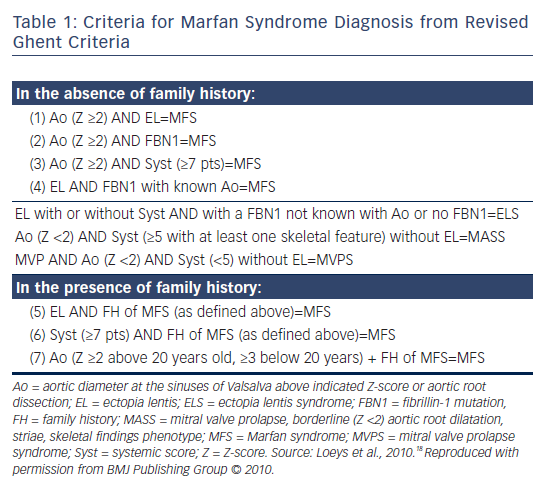 Marfan syndrome (MFS) is a disease in which connective tissue becomes weak secondary to fibrillin-1 mutations, resulting in aortic dilatation, aneurysm formation, aortic dissection, aortic regurgitation and mitral valve prolapse (MVP; see Table 1). In MFS, the main cardiovascular manifestations are aortic dilatation and MVP. Tricuspid regurgitation (TR), pulmonary artery (PA) dilatation, ventricular arrhythmia and dilated cardiomyopathy also occur. In addition, pulse wave velocity (PWV) is higher in MFS patients and PWV of the whole aorta increases with age,24 indicating age-related aortic stiffening in MFS patients, with PWV a sensitive marker of aortic condition. MFS patients have elongated and thickened mitral valve (MV) leaflets. This appears to be due to defective connective tissue and myxomatous degeneration secondary to increased TGF-beta signalling (see Figure 1).27 Ng et al.28 studied mice with FBN1 mutations to determine whether elongation and thickening of the MV leaflets was caused by increased activation and signalling of TGF-beta. They found that treating the mice with a TGF-beta neutralising antibody resulted in regression of the elongation and thickening of the leaflets, which returned to normal. When MR occurs, the left ventricle and left atrium become volume-overloaded, and heart failure may therefore occur in the decompensated phase. Tricuspid valve thickening, prolapse and regurgitation are common findings in MFS patients.1 These may occur due to degeneration of the tricuspid valve. In the study of Gu et al.,25 tricuspid valve involvement was seen in 12 % of MFS patients who underwent valvular or aortic surgery, severe tricuspid valve regurgitation was seen in 3 % of them and required valve repair. Moreover, tricuspid valve involvement sometimes occurred with MV involvement. Echocardiography is widely used for evaluation of cardiac valves and the aortic root, as it is convenient and non-invasive, and can be used in case of emergency. Following initial diagnosis, a second echocardiogram (ECG) should be performed after 6 months to assess the growth of aortic diameter and decide the interval for follow-up.54 Thereafter, echocardiography should be performed at least once a year in adults, unless aortic diameter is 4.5 cm or over, or there is recent major change in the aorta, when echocardiography should be performed twice a year.10 The incidence of aortic dissection is increased in those patients with more rapid increase in aortic diameter compared with those with a slower rate of growth. However, if patients suffer from dry cough because of bradykinin-mediated side effects, taking this drug should be avoided. Patients with MFS should be carefully monitored for early detection of arrhythmia with resting and/or stress ECGs and periodic 24 hour ECG recordings.87 As arrhythmias may be secondary to other cardiac conditions, it is essential to also treat coexisting cardiac disorders. LV dilatation is associated with ventricular arrhythmias in MFS patients; this should be routinely measured and monitored through echocardiography. Beta-blockers, primarily used to prevent aortic dilatation, are thought to provide a parallel protection against arrhythmias. Sometimes atrial fibrillation and ventricular arrhythmia are related to the renin-angiotensin system (RAS), especially in the case of heart failure and myocardial hypertrophy. Agents like ARBs and ACE inhibitors are likely to play a role in reducing the incidence of arrhythmias indirectly by decreasing the primary cardiac disorder, and directly by modulating alterations in ion channels in RAS.87 However, further research is necessary to elucidate the potential role of RAS inhibitors in the prevention of cardiac arrhythmias in MFS patients. Hoffmann et al.46 demonstrated NT-proBNP to be an independent predictor of adverse arrhythmias in patients with MFS, and this new finding might help in selecting patients who are at risk of developing life threatening arrhythmias. Myocardial dysfunction may occur in patients with MFS and may lead to malignant arrhythmia such as ventricular fibrillation. In one case report, a MFS patient with impaired LV function received a cardiac resynchronisation therapy-defibrillator (CRT-D) and experienced improvement through reduced morbidity and less frequent hospitalisation for heart failure.88 Patients at high risk of developing malignant arrhythmias are referred for either an implantable cardiac defibrillator (ICD) or pacemaker. Aortic root surgery is becoming safer. The mortality of elective surgery is 1.5 % compared to that of emergency surgery (11.7 %), survival rate at 5 years is 84 % and at 10 years is 75 %. However, MFS patients have a higher recurrence risk of dissection and aneurysm than in other aortic diseases.90 In Stanford type B dissection, which is seen in 10 % of all aortic dissection in patients with MFS,18 medical treatment is recommended unless there are complications requiring surgery. In all forms of acute aortic dissection, careful pain and blood pressure control is paramount. In aortic dissection type B with complications, for example ischaemia of the lower body or impending aortic rupture, surgery has a higher risk and a stent graft may be used to prevent false lumen enlargement. A stent graft may also be used for patients in whom open surgery is contraindicated.91,92 However, a systematic review reported that although MFS patients with dissection who have had stent graft had 1.9 % mortality, 21.6 % of patients had about 2–3 times the incidence of periprocedural endoleaks compared with non-MFS patients. The problem of endoleaks persisted at an average follow-up of 2.5 years and the final mortality was 12 %.93 For these reasons, stent graft for patients with MFS is not recommended. In the general population, endocarditis developed in only 0.48 % with asymptomatic MVP.96 On the other hand, in a cohort study, MVP and endocarditis were found in 40.0 % and 2.5 % of classic MFS patients, respectively,30 and it was reported that the chance of MFS patients developing MV endocarditis was 0.92 % at 30 years increasing to 13.42 % at 60 years of age.30 Another cohort study investigating classic MFS patients who had MVP with mild to moderate MR reported 6 % of patients developed MV endocarditis. MV-related events including MVP were supposed to be predicted by flail mitral leaflet and mild to moderate MR.29 MFS patients with MVP might have a higher risk of endocarditis. Treatment strategies for cardiac manifestations including betablockers, elective aortic root replacement and MV repair surgery have improved the life expectancy of people with MFS. Despite this improvement, cardiac morbidity remains a major concern among individuals with MFS. 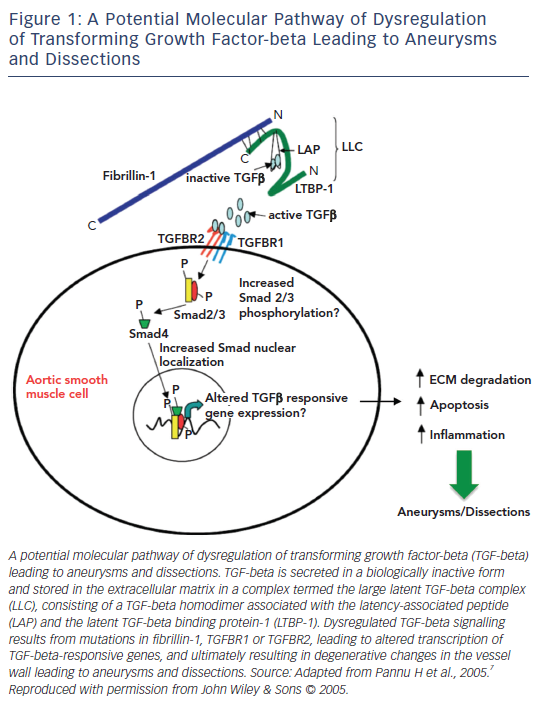 Newer approaches, such as the use of ARBs are believed to partly exert their beneficial effects by reducing TGFbeta activity, which has been recognised to play a pivotal role in the pathogenesis of the cardiac manifestations in MFS. However, ARBs have important limitations, and therefore further studies need to be performed to develop therapies that are specifically aimed at reducing TGF-beta activity. Weve H. Über Arachnodaktylie (Dystrophia mesodermalis congenita, Typus Marfan). Arch Augenheilkd 1931;104:1–46. Kainulainen K, Pulkkinen L, Savolainen A, et al. Location on chromosome 15 of the gene defect causing Marfan syndrome. N Engl J Med 1990;323:935–9. Dietz HC, Cutting GR, Pyeritz RE, et al. Marfan syndrome caused by a recurrent de novo missense mutation in the fibrillin gene. Nature 1991;352:337–9. Chiu HH, Wu MH, Chen HC, et al. Epidemiological profile of Marfan syndrome in a general population: a national database study. Mayo Clin Proc 2014;89:34–42. Pannu H, Tran-Fadulu V, Milewicz DM. 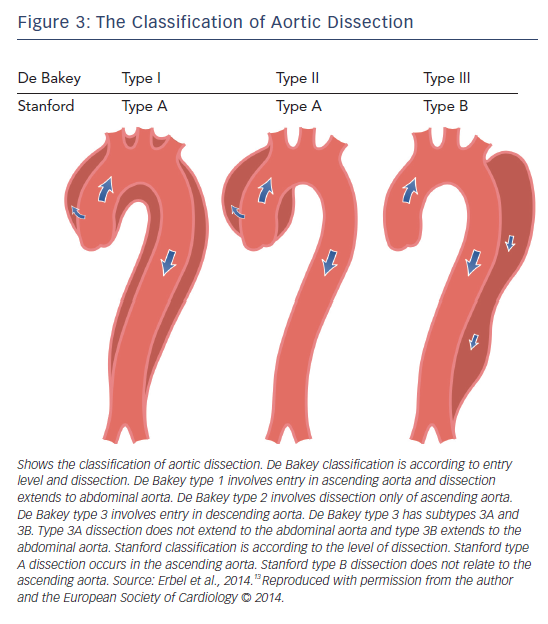 Genetic Basis of Thoracic Aortic Aneurysms and Aortic Dissections. Am J Med Genet C Semin Med Genet 2005;139C:10–6. Milewicz DM, Dietz HC, Miller DC. Treatment of aortic disease in patients with Marfan syndrome. Circulation 2005;111:e150– 7. Ammash NM, Sundt TM, Connolly HM. Marfan syndrome— diagnosis and management. Curr Probl Cardiol 2008;33:7–39. Detaint D, Michelena HI, Nkomo VT, et al. Aortic dilatation patterns and rates in adults with bicuspid aortic valves: a comparative study with Marfan syndrome and degenerative aortopathy. Heart 2014;100:126–34. Detaint D, Faivre L, Collod-Beroud G, et al. Cardiovascular manifestations in men and women carrying a FBN1 mutation. Eur Heart J 2010;31:2223–9. Erbel R, Aboyans V, Boileau C, et al. 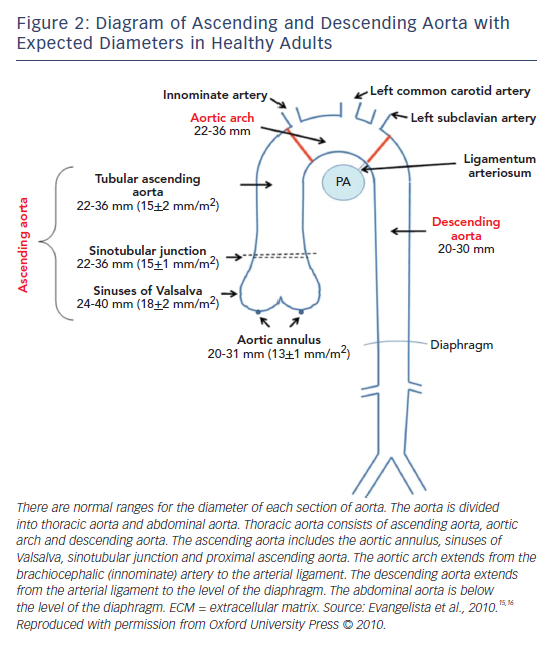 2014 ESC Guidelines on the diagnosis and treatment of aortic diseases: Document covering acute and chronic aortic diseases of the thoracic and abdominal aorta of the adult. The Task Force for the Diagnosis and Treatment of Aortic Diseases of the European Society of Cardiology (ESC). Eur Heart J 2014;35:2873–926. Evangelista A, Flachskampf FA, Erbel R, et al. Corrigendum to: Echocardiography in aortic diseases: EAE recommendations for clinical practice. Eur J Echocardiogr 2010;11:645–58. Evangelista A, Flachskampf FA, Erbel R, et al. Echocardiography in aortic diseases: EAE recommendations for clinical practice. Eur J Echocardiogr 2010;11:645–58. Campens L, Demulier L, De Groote K, et al. Reference values for echocardiographic assessment of the diameter of the aortic root and ascending aorta spanning all age categories. Am J Cardiol 2014;114:914–20. Loeys BL, Dietz HC, Braverman AC, et al. The revised Ghent nosology for the Marfan syndrome. J Med Genet 2010;47:476– 85. Kari FA, Russe MF, Peter P, et al. Late complications and distal growth rates of Marfan aortas after proximal aortic repair. Eur J Cardiothorac Surg 2013;44:163–71. Januzzi JL, Marayati F, Mehta RH, et al. Comparison of aortic dissection in patients with and without Marfan’s syndrome (results from the International Registry of Aortic Dissection). Am J Cardiol 2004;94:400–2. Januzzi JL, Isselbacher EM, Fattori R, et al. Characterizing the young patient with aortic dissection: results from the International Registry of Aortic Dissection (IRAD). J Am Coll Cardiol 2004;43:665–9. Westenberg JJ, Scholte AJ, Vaskova Z, et al. Age-related and regional changes of aortic stiffness in the Marfan syndrome: assessment with velocity-encoded MRI. J Magn Reson Imaging 2011;34:526–31. Ito H, Oe H. Journal of Clinical Cardiology. Bunkodo 2012;13:656–62. Judge DP, Rouf R, Habashi J, Dietz HC. Mitral valve disease in Marfan syndrome and related disorders. J Cardiovasc Transl Res 2011;4:741–7. Rybczynski M, Treede H, Sheikhzadeh S, et al. Predictors of outcome of mitral valve prolapse in patients with the Marfan syndrome. Am J Cardiol 2011;107:268–74. Rybczynski M, Mir TS, Sheikhzadeh S, et al. Frequency and age-related course of mitral valve dysfunction in the Marfan syndrome. Am J Cardiol 2010;106:1048–53. Kühne K, Keyser B, Groene EF, et al. FBN1 gene mutation characteristics and clinical features for the prediction of mitral valve disease progression. Int J Cardiol 2013;168:953–9. De Paepe A, Devereux RB, Dietz HC, et al. Revised diagnostic criteria for the Marfan syndrome. Am J Med Genet 1996;62:417– 26. De Backer J. Cardiovascular characteristics in Marfan syndrome and their relation to the genotype. Verh K Acad Geneeskd Belg 2009;71:335–71. Pyeritz RE, Wappel MA. Mitral valve dysfunction in the Marfan syndrome. Clinical and echocardiographic study of prevalence and natural history. Am J Med 1983;74:797–807. Lundby R, Rand-Hendriksen S, Hald JK, et al. The pulmonary artery in patients with Marfan syndrome: a cross-sectional study. Genet Med 2012;14:922–7. Pati PK, George PV, Jose JV. Giant pulmonary artery aneurysm with dissection in a case of Marfan syndrome. J Am Coll Cardiol 2013;61:685. Meijboom LJ, Timmermans J, van Tintelen JP, et al. Evaluation of left ventricular dimensions and function in Marfan’s syndrome without significant valvular regurgitation. Am J Cardiol 2005;95:795–7. Alpendurada F, Wong J, Kiotsekoglou A, et al. Evidence for Marfan cardiomyopathy. Eur J Heart Fail 2010;12:1085–91. Halloran BG, Davis VA, McManus BM, et al. Localization of aortic disease is associated with intrinsic differences in aortic structure. J Surg Res 1995;59:17–22. De Backer JF, Devos D, Segers P, et al. Primary impairment of left ventricular function in Marfan syndrome. Int J Cardiol 2006;112:353–8. Angtuaco MJ, Vyas HV, Malik S, et al. Early detection of cardiac dysfunction by strain and strain rate imaging in children and young adults with marfan syndrome. J Ultrasound Med 2012;31:1609–16. Kiotsekoglou A, Saha S, Moggridge JC, et al. Impaired biventricular deformation in Marfan syndrome: a strain and strain rate study in adult unoperated patients. Echocardiography 2011;28:416–30. Hoffmann BA, Rybczynski M, Rostock T, et al. Prospective risk stratification of sudden cardiac death in Marfan’s syndrome. Int J Cardiol 2013;167:2539–45. de Witte P, Aalberts JJJ, Radonic T, et al. Intrinsic biventricular dysfunction in Marfan syndrome. Heart 2011;97:2063–8. Dietz HC. Marfan Syndrome. GeneReview® [Internet]. 2014. Available at: www.ncbi.nlm.nih.gov/books/NBK1335 (21 September 2016). Keane MG, Pyeritz RE. Medical management of Marfan syndrome. Circulation 2008;117:2802–13. Savolainen A, Kupari M, Toivonen L, et al. Abnormal ambulatory electrocardiographic findings in patients with the Marfan syndrome. J Intern Med 1997;241:221–6. Yetman AT, Bornemeier RA, McCrindle BW. Long-term outcome in patients with Marfan syndrome: is aortic dissection the only cause of sudden death? J Am Coll Cardiol 2003;41:329–32. Schaeffer BN, Rybczynski M, Sheikhzadeh S, et al. Heart rate turbulence and deceleration capacity for risk prediction of serious arrhythmic events in Marfan syndrome. Clin Res Cardiol 2015;104:1054–63. Cañadas V, Vilacosta I, Bruna I, Fuster V. Marfan syndrome. Part 2: treatment and management of patients. Nat Rev Cardiol 2010;7:266–76. Lang RM, Badano LP, Mor-Avi V, et al. Recommendations for Cardiac Chamber Quantification by Echocardiography in Adults: An Update from the American Society of Echocardiography and the European Association of Cardiovascular Imaging. J Am Soc Echocardiogr 2015;28:1–39. e14. Radke RM, Baumgartner H. Diagnosis and treatment of Marfan syndrome: an update. Heart 2014;100:1382–91. Meijboom LJ, Timmermans J, Zwinderman AH, et al. Aortic root growth in men and women with the Marfan’s syndrome. Am J Cardiol 2005;96:1441–4. Baumgartner H, Bonhoeffer P, De Groot NM, et al. ESC Guidelines for the management of grown-up congenital heart disease (new version 2010). Eur Heart J 2010;31:2915–57. Burman ED, Keegan J, Kilner PJ. Aortic root measurement by cardiovascular magnetic resonance: specification of planes and lines of measurement and corresponding normal values. Circ Cardiovasc Imaging 2008;1:104–13. Pyeritz RE. Marfan syndrome: 30 years of research equals 30 years of additional life expectancy. Heart 2009;95:173–5. Finkbohner R, Johnston D, Crawford ES, et al. Marfan Syndrome: Long-term survival and complications after Aortic aneurysm repair. Circulation 1995;91:728–33. Silverman DI, Burton KJ, Gray J, et al. Life expectancy in the Marfan syndrome. Am J Cardiol 1995;75:157–60. Palatini P. Exercise haemodynamics: field activities versus laboratory tests. Blood Press Monit 1997;2:133–7. Boodhwani M, Andelfinger G, Leipsic J, et al. Canadian Cardiovascular Society position statement on the management of thoracic aortic disease. Can J Cardiol 2014;30:577–89. Rybczynski M, Koschyk D, Karmeier A, et al. Frequency of sleep apnea in adults with the marfan syndrome. Am J Cardiol 2010;105:1836–41. Rybczynski M, Koschyk DH, Aydin MA, et al. Tissue Doppler imaging identifies myocardial dysfunction in adults with Marfan syndrome. Clin Cardiol 2007;30:19–24. Rios AS, Silber EN, Bavishi N, et al. Effect of long-term betablockade on aortic root compliance in patients with Marfan syndrome. Am Heart J 1999;137:1057–61. Salim MA, Alpert BS, Ward JC, Pyeritz RE. Effect of betaadrenergic blockade on aortic root rate of dilation in the Marfan syndrome. Am J Cardiol 1994;74:629–33. Shores J, Berger KR, Murphy EA, Pyeritz RE. Progression of aortic dilatation and the benefit of long-term beta-adrenergic blockade in Marfan’s syndrome. N Engl J Med 1994;330:1335– 41. Gersony DR, McClaughlin MA, Jin Z, Gersony WM. The effect of beta-blocker therapy on clinical outcome in patients with Marfan’s syndrome: a meta-analysis. Int J Cardiol 2007;114:303–8. Cook JR, Carta L, Galatioto J, Ramirez F. Cardiovascular manifestations in Marfan syndrome and related diseases; multiple genes causing similar phenotypes. Clin Genet 2015;87:11–20. Groenink M, den Hartog AW, Franken R, et al. Losartan reduces aortic dilatation rate in adults with Marfan syndrome: a randomized controlled trial. Eur Heart J 2013;34:3491–500. Chiu HH, Wu MH, Wang JK, et al. Losartan added to β-blockade therapy for aortic root dilation in Marfan syndrome: a randomized, open-label pilot study. Mayo Clin Proc 2013;88:271–6. Forteza A, Evangelista A, Sánchez V, et al. Efficacy of losartan vs. atenolol for the prevention of aortic dilation in Marfan syndrome: a randomized clinical trial. Eur Heart J 2016;37:978– 85. Milleron O, Arnoult F, Ropers J, et al. Marfan Sartan: a randomized, double-blind, placebo-controlled trial. Eur Heart J 2015;36:2160–6. Franken R, Mulder BJM. Aortic disease: Losartan versus atenolol in the Marfan aorta—how to treat? Nat Rev Cardiol 2015;12:447–8. Yetman AT, Bornemeier RA, McCrindle BW. Usefulness of enalapril versus propranolol or atenolol for prevention of aortic dilation in patients with the Marfan syndrome. Am J Cardiol 2005;95:1125–7. Asmar RG, London GM, O’Rourke ME, et al. Improvement in blood pressure, arterial stiffness and wave reflections with a very-low-dose perindopril/indapamide combination in hypertensive patient: a comparison with atenolol. Hypertension 2001;38:922–6. Nagashima H, Uto K, Sakomura Y, et al. An angiotensinconverting enzyme inhibitor, not an angiotensin II type- 1 receptor blocker, prevents beta-aminopropionitrile monofumarate-induced aortic dissection in rats. J Vasc Surg 2002;36:818–23. Williams A, Davies S, Stuart AG, et al. Medical treatment of Marfan syndrome: a time for change. Heart 2008;94:414–21. Chung AW, Yang HH, Radomski MW, van Breemen C. Longterm doxycycline is more effective than atenolol to prevent thoracic aortic aneurysm in Marfan syndrome through the inhibition of matrix metalloproteinase-2 and -9. Circ Res 2008;102:e73–86. Gott VL, Greene PS, Alejo DE, et al. Replacement of the Aortic Root in Patients With Marfan’s Syndrome. N Engl J Med 1999;340:1307–13. Botta L, Russo V, La Palombara C, et al. Stent graft repair of descending aortic dissection in patients with Marfan syndrome: An effective alternative to open reoperation? J Thorac Cardiovasc Surg 2009;138:1108–14. Nordon IM, Hinchliffe RJ, Holt PJ, et al. Endovascular management of chronic aortic dissection in patients with Marfan syndrome. J Vasc Surg 2009;50:987–91. Pacini D, Parolari A, Berretta P, et al. Endovascular Treatment for Type B Dissection in Marfan Syndrome: Is It Worthwhile? Ann Thorac Surg 2013;95:737–49. Prophylaxis against infective endocarditis: Antimicrobial prophylaxis against infective endocarditis in adults and children undergoing interventional procedures: Nice guidelines [CG64] [Internet]. 2008 [cited 2015 Sep 24]. Available at: http://www.nice.org.uk/guidance/cg64/ chapter/Recommendations (Accessed 19 September 2016). Wilson WR, Taubert KA, Gewitz M, et al. Prevention of infective endocarditis: guidelines from the American Heart Association: a guideline from the American Heart Association Rheumatic Fever, Endocarditis, and Kawasaki Disease Committee, Council on Cardiovascular Disease in the Young, and the Council on Clinical Cardiology, Council on Cardiovascular Surgery and Anesthesia, and the Quality of Care and Outcomes Research Interdisciplinary Working Group. Circulation 2007;116:1736–54. Avierinos JF, Gersh BJ, Melton LJ 3rd, et al. Natural history of asymptomatic mitral valve prolapse in the community. Circulation 2002;106:1355–61. The Marfan Foundation [Internet]. 2015 [cited 2015 Sep 24]. Available at: www.marfan.org/resource/fact-sheet/ endocarditis-prophylaxis-people-marfan-syndrome#.Vo4- 7878m6E (Accessed 19 September 2016).